Download your copy of the this month’s newsletter now. 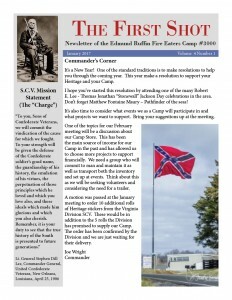 Be sure to read our 1st Lt. Commanders message from important information. YOU COULD BE ELECTED 1ST LT. COMMANDER!!! THINK ABOUT THAT!!!! FIRST: You will be able to enjoy socializing with fellow Southerners, catching up with all the recent happenings that impact our Camp and the Southern Cause. You will be able to break bread together with Compatriots, Friends, Associates, OCR members, ANVMC members and Ladies of the Camp, enjoying the good food at Anna’s Italian Restaurant. You will be able to watch, listen to, hear and participate in the fantastic fun provided by the boisterous behavior and continuous loud laughter from that now infamous location in our Camp meeting room (assuming that the Instigator/Raucous Rebel Belle, Cathy Hendricks, is attending)!!! You have to be there to witness this activity. It is all part of the fun of being at a Fire Eater meeting. Second: You will hear an interesting keynote speaker make a presentation concerning the Southern Cause. This month our guest speaker is our good friend, Bo Traywick, who lives in Richmond, has published at least one book about the South, and is frequently published in the Richmond Times Dispatch. Bo has spoken at our Camp in the past, and will be presenting a new topic entitled “The Virginia Decision–1861”. Finally: We need everyone to attend the meetings to support our Camp in all of its activities. There are a variety of opportunities to serve the Camp and gain fulfillment from your membership in the Camp. Come to the meeting and see what activity interests you. I Triple Dog Dare you to not attend this meeting!! !